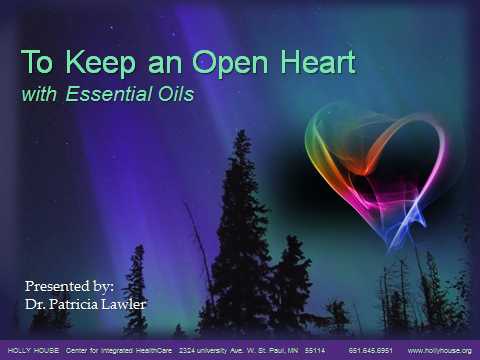 "I hope you enjoyed my presentation of “To Keep An Open Heart”. Are you a candidate for natural health care? Do you want to feel better or live longer? Do you believe that the quality of your physical, mental-emotional, and spiritual states are interdependent? Do you prefer to resolve unwanted symptoms by addressing their underlying cause? Would you rather avoid negative side effects? Of course you are, you’re involved with Young Living. Perhaps though, you are still searching for something. Perhaps, you feel uneasy about an over reliance on conventional medicine or perhaps, even though Young Living provides you with access to nature's wonderful plant medicines, you still find it difficult to resolve all the health challenges you encounter on your own. This would not be surprising. Human beings are highly complex organisms. No two are alike. When bodies break down, accurately diagnosing the cause then choosing and delivering an effective intervention can be terribly challenging. As you know, doctors make whole careers out of it and still have much to learn. When you try to decipher conditions on your own, you sometimes face the depths of this complexity. The more you know the more you realize you don’t. The strengths of conventional medicine do not come without drawbacks. If you try self-care, you might turn to Young Living for guidance, only to discover that, though quite helpful in the past, it has essentially been muted by the FDA on the therapeutic capacities of their oils. Instead, you might try books or the internet only to be overwhelmed by vast volumes of information. Upon closer scrutiny, much could seem contradictory and self-serving, only address part of your problem, superficially skim the surface, and/or not quite match the specifics of your particular circumstance. Family and friends can be helpful if they are sufficiently skilled, available, and interested but, if you are not so fortunate to have such people in your close social circle, how do you put the whole picture together? how do you choose which path to follow? how to you help when those you love and depend upon you are unwell? how do you best manage your own most precious asset? Though essential oils have been shown to have a powerful therapeutic effect when used appropriately, what’s appropriate is not always necessarily clear and, even then, might only provide one piece of a person’s wellness puzzle. If you don’t have time to earn a degree in nutrition, naturopathy, chiropractic, or a related field and even if you do, sometimes, it just makes sense to engage the support of a professional. It always helps though, when (s)he shares your beliefs and values. Of course, health professionals come in many different stripes and colors. One does not necessarily require a license or even a certificate to claim to be one. True, some without credentials have committed themselves to years of informal training and a few even seem naturally gifted but the more serious or complex the problem, the more important trust and the right decision become. Credentials guarantee certain requirements have been and, in some cases, continue to be met and that training was, at least somewhat, methodical. We like to think that Dr. Pat offers a broad and deep mix of many such relevant skills, aptitudes, experience, and training and that she has credentials that prove it. CLICK, if you wish to check Dr. Pat's Credentials. Dr. Lawler has practiced chiropractic (DC) and natural health care since 1977. She has advanced training and/or certification in neurology, clinical nutrition (DACBN, DCBCN), naturopathy (CTN), and bioenergetic techniques including neuromodulation technique (NMT), NAET, KST, acupuncture, and Reiki. Dr. Pat’s work integrates numerous natural disciplines acquired on a life long journey began even before she began practice in 1977. She devotes constant attention to remaining abreast of the accelerating field of biochemistry as it pertains to natural medicine and to the many applications that flow from it. You'll be pleased to note that Young Living essential oils hold an important place in her doctoring kit. All in all, her perspectives deliver a uniquely potent and comprehensive approach to improving health effectively, efficiently, and safely. Literally, thousands have benefited over the years, including many from the Young Living community, who we especially love because, for the most part, they already “get it”. At a summary level, her support process is straight forward. After listening to, assessing, and discussing your needs, her treatment strategies target the cause of dysfunction, thereby releasing your body's innate ability to heal and helping you experience the health, vitality, and longevity that you desire. From anxiety to fatigue, from insomnia to headaches, from hormonal imbalances to auto injuries, from musculo-skeletal pain to weight loss, structural, mental-emotional, biochemical, electromagnetic, or spiritual. Whether you live locally or remotely, if you are willing to make the effort to provide your body, mind, and spirit their needs, chances are good that she can help. Dr. Pat was originally drawn to the field of health care by a strong desire to help others. It's plain to see that this same motivation continues to drive her today. If you are ever in need of care, please do not hesitate to contact us. In case you have a current need, we'd like to make your decision to see us a little easier by extending you the special offer you see below. You will not find a better time to seek our support. In recognition of the proactive steps you are taking toward healing and our self-confessed affinity for the Young Living community, for a limited time only, HOLLY HOUSE is happy to provide you with a special YLSS discount off the price of an initial appointment. To receive this special discount and learn more about our initial appointment options, please enter your name and email address to the right. Unfortunately, we are too busy serving patients to send emails frequently or even regularly but by submitting this form, you are never-the-less granting HOLLY HOUSE Center for Integrated HealthCare permission to email you. If you do not wish to receive emails from us, you can revoke your permission at any time using the SafeUnsubscribe® link, found at the bottom of every message we send.